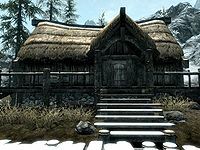 Alva's House is a small house located in Morthal that is home to Alva and Hroggar. It is the next house along the jetty from the Guardhouse. There are two flights of stairs leading up to the decking at the front of the house, which has a wooden bench and two food barrels on it. The door is normally adept locked. On your left when entering is a food barrel beside a long wooden table which holds two bottles of alto wine, a bottle of wine, two bottles of Nord mead, a sample of snowberries, two pine thrush eggs, a cabbage and several loaves of bread. Above the table, hanging from the ceiling are two garlic braids, three bunches of elves ear and a bunch of frost mirriam. To the right of the table is a basket containing two leeks and hanging from a rack above are three rabbits. In the northern corner are two barrels, one of which is a fish barrel. There is a large double bed against the northeast wall and a table holding two bottles of Black-Briar mead is to the right of it. At the foot of the double bed is an unlocked chest which contains leveled items. Next to this against the southeast wall is a tall wardrobe containing clothes, with a lute leaning against it on the right. Opposite the door to the cellar is a fireplace with a cooking pot in front and a collection of common books and a copy of 2920, Sun's Dusk, v11 on the mantlepiece. To the left of the fireplace is a flight of stairs down to the cellar. This is the only house in Morthal to have a cellar. To the right of the fire are several barrels and sacks of food. Against the southwest wall is a square wooden table and two chairs. On the table is a copy of Immortal Blood, five loose coins, an iron dagger and a medium coin purse. 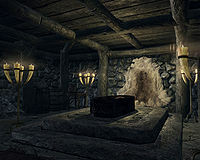 In the western corner and along the southeastern wall is a single bed with an unlocked chest at the foot of the bed, which contains leveled items. Upon entering the cellar you will see an open coffin on a raised section in the middle of the room, if it is during the day it will have Alva slumbering inside, as well as Alva's Journal--(see notes). Around the room against the northeast wall are several straw bales. In the eastern corner are a couple of barrels and a round wooden table holding two nightshade flowers. Against the southeast wall are several crates and barrels, some of which contain foodstuffs. If you haven't started the relevant quest Alva's Journal will be missing from the coffin. However even if you have already killed Alva, once the quest progresses to the point of needing proof for the Jarl, then Alva's Journal will mysteriously appear in the coffin.